An Egyptian cartoonist known for his satirical slant on political issues was briefly arrested accused of "running a website without a license". 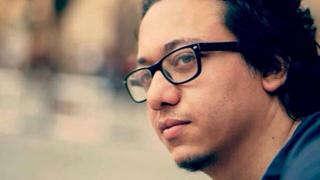 Islam Gawish was released on Monday reportedly without charge, a day after his arrest in Cairo. Opposition parties and activists had said his arrest targeted freedom of opinion and expression. There are growing concerns about human rights in Egypt as officials increasingly cut down on dissent. Gawish was arrested during a police raid on the headquarters of the Egypt News Network website, where he worked. He was accused of running a website without a permit and using pirated computer software, the interior ministry said in a statement on Sunday. It was not clear which website the ministry was referring to. The state-run website Al-Ahram reported that he was released without charge. A popular cartoonist, Gawish has published his work on a Facebook page that has more than 1.6 million followers. He has satirised government figures, including President Abdul Fattah al-Sisi, and aspects of daily life. The faces of Egypt's revolution - where are they now? His arrested was widely criticised on social media and by opposition parties and activists. In a statement posted on Facebook, a group of eight political parties and around 50 activists accused the government of "restricting freedom of opinion and expression". It said: "This approach is totally unacceptable and there has to be an end for targeting people with free opinions, who wish for nothing but living in a country that respects freedom of opinion and expression, according to the constitution." Human rights groups have criticised the Egyptian government for its campaign against activists and journalists. Amnesty International has warned that Egypt is now "mired in a human rights crisis of huge proportions", as the country "reverts back to a police state". In January, ahead of the fifth anniversary of the uprising against former President Hosni Mubarak, several people were arrested, including two activists accused of running dozens of Facebook pages supporting the outlawed Muslim Brotherhood and calling for protests. Recent raids have also targeted sites popular with activists, which have been shut down. As former armed forces chief, Mr Sisi led the army's overthrow of President Mohammed Morsi, an ex-Muslim Brotherhood official, in 2013 following mass protests. Since then, more than 1,000 people have been killed and 40,000 are believed to have been jailed. Most of them have been supporters of the Brotherhood, which was banned in 2013, but secular and liberal activists have also been prosecuted for breaking a 2013 anti-protest law.